(This story won’t sound relevant to recyclable boxes or setup boxes, but I promise it’s getting there)! Last December, I received a glass tumbler from Starbucks that I absolutely loved. Although it technically *just packaging,* I also loved the box it came in. Starbucks does a great job creating attractive packaging, and their two-piece setup boxes for the holidays are durable and always feature rich colors. Each year has a different color: last year was red, this year was green, and so on. They also design a brand new series of tumblers every year, so when they sell out, they’re gone forever. But I used the setup box to package another gift, keeping the lovely tumbler for myself. However, maybe as a lesson regarding growing too fond of things, I accidentally dropped the tumblr at a gas station in sub-zero temperatures. It shattered. I was sad, and I must have mentioned the fact to my mother (we bought the tumbler together). Lo and behold, this Christmas, I took the wrapping paper off a present. 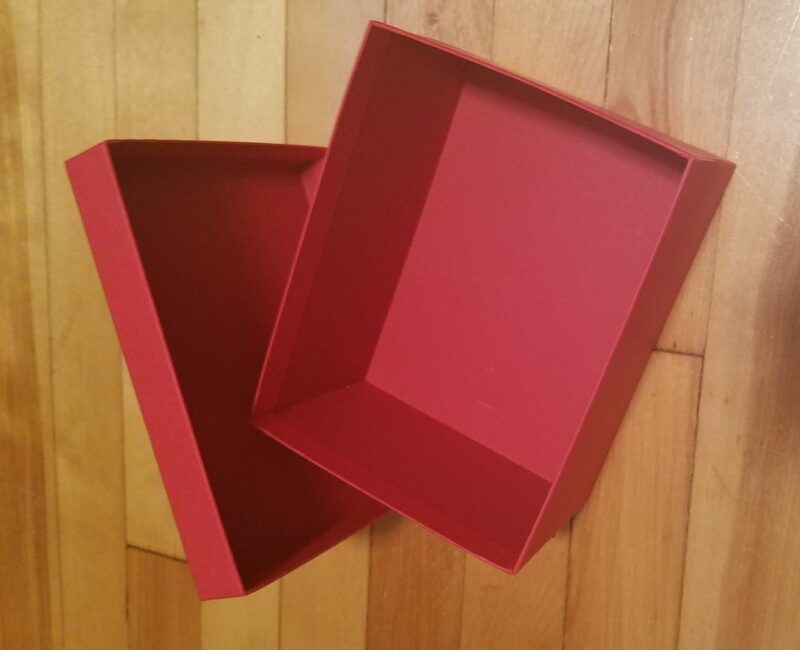 I recognized the red box, but in the back of my head, I knew that the gift boxes from Starbucks this year were green. I opened the box, and there it was. My shattered tumbler, which she had found online, whole again. Added bonus: I got to keep the box this time around! As the major December holidays pass, most households are left with a lot of new things which need to find homes as well as a lot of boxes and wrapping paper. Recyclable boxes aren’t a problem (wrapping paper is another story, since the majority of it isn’t recyclable). There are plenty of ways to take sturdy gift boxes and repurpose them around the house. The easiest thing to do with when you receive a nice gift box? Reuse it for its intended purpose. The wrong attitude is to think of it as someone else’s problem; rather, think of it as spreading the joy of a nicely-packaged custom gift box. Full disclosure: This is how I’m using my own Starbucks setup box. My workspace at home has drawers with organizers, but I’m always looking for something to help me out on top of the desk that doesn’t look like it came from an office supply store. The red box is colorful and not too big. It’s made of sturdy chipboard with sharp edges, so I know it won’t look battered in a few weeks. It’s perfect to hold my oh-so-necessary supply of Gin-Gins, lip balm, favorite fine tip marker pens, and other random necessities, all in one place. It’s nearly time to pack up all those holiday decorations. Use the sturdier of the boxes you received to switch out any older packaging that’s starting to wear, or to keep any new items safe. In my house, the holiday decorations are pretty secure, in one spot, but occasionally there might be some jostling. Keep your memories safe and secure with an updated custom gift box. Break them down and put them in the recycling. Reasonable sentimentality can only go so far. But next year, keep in mind how someone might get some enjoyment out of a nice setup box for their gift. How do you upcycle recyclable boxes from the holidays?